Orange-crowned Warblers have a wide range throughout North America. 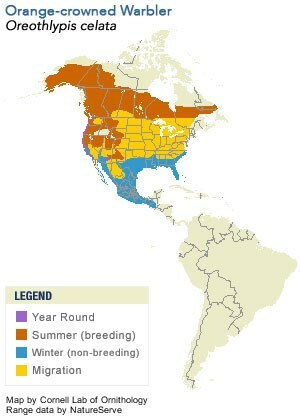 They spend their summers in Canada and the Western US, and they winter in Mexico and Central America. They pass through much of the remainder of the US during migration, but most people will never notice them with their olive-gray color and lack of bold markings. The orange crown patch for which they are named is rarely seen. The Orange-crowned is one of the few warblers that is more common in the Western states than in the East. They rarely visit backyards and prefer low, dense habitats. 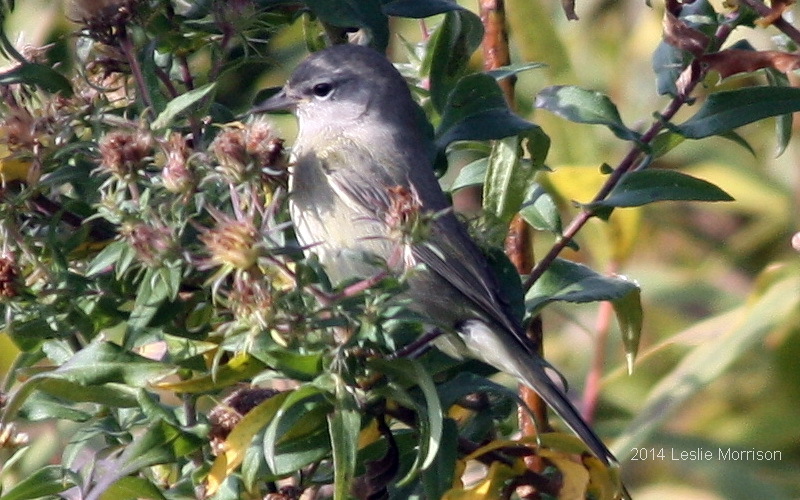 I spotted this bird at the park in the restored prairie foraging with a flock of Goldfinches. Warblers are incredibly difficult to photograph. They are quick moving and constantly jump from plant to plant. I was lucky this one was low enough to the ground to be in camera range, and hungry enough to tolerate my presence while he continued to forage for food. What a greta picture, it looks like it could be in a magazine! You did a great job of capturing this little guy’s portrait. Your bird photos always amaze me. My Saturday Snapshots are from the Cinque Terre. He is beautiful…and so are his surrounding! He looks rather fragile – great pic, Leslie. i don’t think I’ve seen this one. Now all the warblers have flown away in my neck of the woods. Haven’t had much luck seeing birds other than the Chickadees and Woodpeckers. Small birds are so tricky to photograph. And I hate when they name birds after things that aren’t usually there, or impossible to see.